Q – Much advice on taking precautions against the current heat wave is given in the media these days. What are your views about such advice? A – Nowadays, the media advices people on protecting themselves from the current hot weather. But the public should be careful and follow only the correct advice to minimise health problems. These days, the temperature in Sri Lanka is higher than usual. Sometimes, this condition may affect people’s health as well. Usually, body temperature is controlled by sweating, but when humidity in the environment rises, this process does not take place properly. Q - What should we do to protect ourselves during the hot weather? A - People should drink more water no matter how much they usually drink. During physical exercise, more liquid should be taken, that is, more than the usual amount needed to quench thirst. During physical exercise, two to four glasses of liquid should be taken in an hour. This is essential for elderly people and children. The mineral requirement will be provided by adding adequate salt to food as usual. People, especially children should limit physical activities up to the level that the body can tolerate. Limiting activities to early morning and evening is recommended. Everyone should try to stay in the shade and inside buildings as much as possible. It is better if they can stay in an air-conditioned environment. Fans can also be used. Baths or showers with cold water will also decrease body temperature. Wearing a cap or using an umbrella when outdoors and wearing light-coloured lightweight or loose cotton clothes are recommended. Q - What shouldn’t we do? A - People should not take hot meals and hot drinks such as tea and coffee. People should not expose themselves to the sun. Rooms should be properly ventilated. People should not consume alcohol and extremely cold drinks. 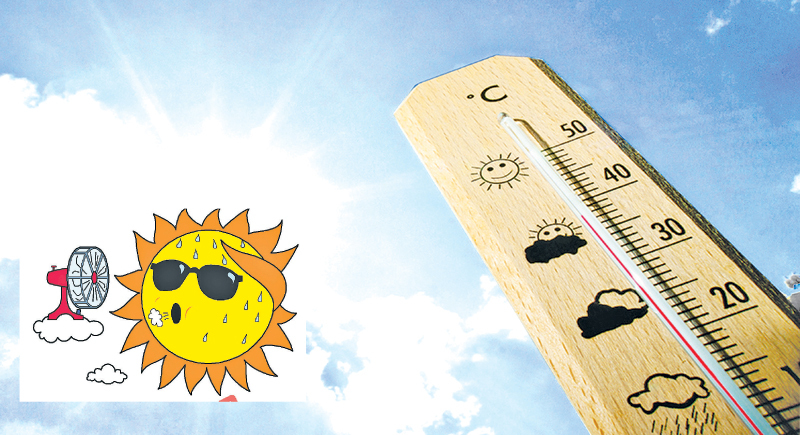 Q - What are the health issues related to this hot weather? A - If a person feels extremely tired has palpitation and difficulty in breathing during physical exercise, he or she should immediately stop the activity and rest in the shade. If a person has a heavy head or feels faint, he or she should seek help. Taking short breaks in the shade is a must for all those working outdoors. Sun creams can be used to prevent sunburns and blisters. Redness and irritation of the skin can result. Skin rashes can appear on the neck, chest and breasts. Skin rashes can be prevented by staying in cool places and keeping the skin cool. If children get sunburns, it is better to consult a doctor. Cramps can be eased by drinking minerals and resting. Drinking sugary drinks also would help. It is better to consult a doctor if the condition does not subside within an hour. Some people get heat strokes, but it is very rare in Sri Lanka. Heat strokes occur when the body fails to control the body temperature and the brain and nervous system may be damaged. Q – What are the most vulnerable groups? A - The vulnerable groups are infants and children below four years, elders over 65, the obese, people who are involved in heavy physical activity and sick people. Infants, children and the elderly are extremely sensitive to temperature changes and depend on others to keep their body temperature normal. The obese cannot easily lower their body temperature due to the fat layer in the body. Infants should be kept in light clothing and should be given more liquids. Hot meals and drinks should not be given to them.